Tilonia, a small village in the desert regions of Rajasthan, India, is the home of the Barefoot College. Since 1972, the College has worked to improve the lives of the rural poor by addressing basic needs for water, electricity, housing, health, education and income. 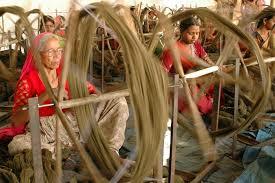 Tilonia helps these rural artisans to market their products in India and around the world. With new markets for their crafts, their livelihood is improved and the production of the traditional crafts is continued. The Tilonia Home collection of home textiles features a variety of decorative pillows, bedspreads, quilts and duvet covers suitable for contemporary decorative styles while still reflective of Indian craft traditions. Tilonia Home brings the colour and spice of India to your home. The Tilonia Artisan collection of gifts and accessories offers handcrafted scarves and shawls, appliquéd and quilted bags, handmade paper books, and colourful decorative items for the home. From the deserts of Rajasthan to the mountains of the Himalayas, Tilonia Artisan spans the cultures and traditions of India. Tilonia appliqué is taught to women by the Barefoot College, uses designs adapted from mandanas which are traditional patterns on floors in Rajasthan. 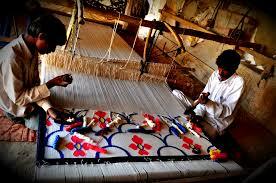 Abstract motifs are cut from fabrics and then stitched onto the base. Duvet sets, quilts and decorative pillow covers are sewn by women artisans of Tilonia from block print cotton fabrics hand printed by block printers of Bagru in rural Rajasthan. KR: My name is Kritika Rao. KR: My batch year was 2012-2013. KR: My batch mates were Ravina, Poornima, Soniya, Ishu, Shilpa, Monica, Ranveer, etc. KR: My present qualifications are B.com B.Ed. KR: My favourite teacher of my time was Bharti Ma’am. ED: Have you ever participated in any of activity, competitions or tournaments? KR: Yes, I have participated in Rakhi making competition and House Competitions. ED: What is your experience in the school? KR: My experience in the school is very good, all were very nice and today also I miss all those days in this school. ED: Do you have any memory from this school? KR: Yes, I have a great memory with my classmates we all spent our good time in school and had good relationships with others. We had a great bonding with teachers.Today also I miss all the teachers. ED: Would you like to give any message to your friends, juniors or the school students? KR: I just want to tell all the students who are studying now in the school that you all are getting good and better knowledge in this School. I hope you all will brighten your school's name in the future. Good Luck to all! Staff had PDP Session on Monday, 10th July. They had Skype Meeting with Smiriti Krishnia. They discussed the Core Values which is needed by a child. First one representative from each group came and told about the qualities which they felt is most important for a child to possess and what was their understanding about values. Then Smiriti discussed the Value of Happiness. Six questions were asked about what is happiness, what makes you happy, how do you overcome unhappiness, how important is happiness in the classroom, why are students unhappy and what will you do as an Educator to change this? All the groups one by one gave their opinion. Then Smriti showed a slide about her opinion on Happiness. The Staff wished Mr. Usman Gani and Mrs. Kusum Sharma a Happy Birthday. 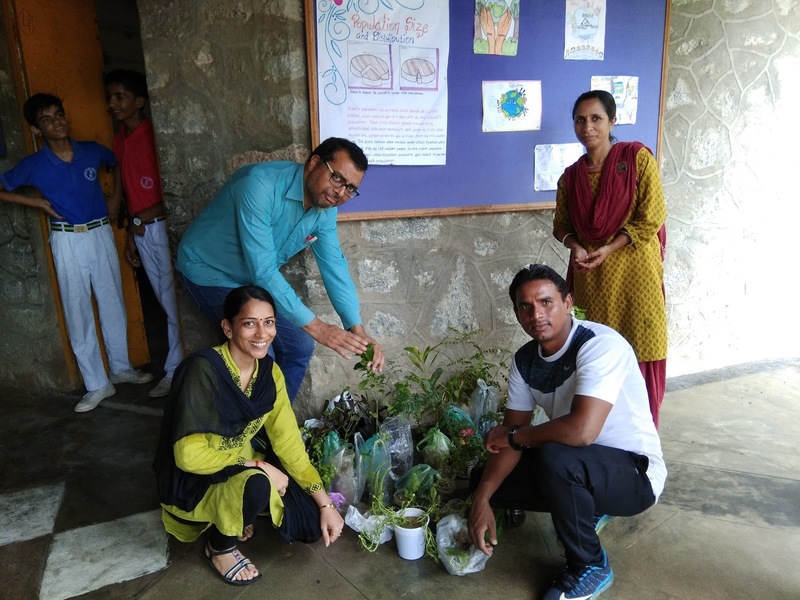 Ms. Vimmy Rajpurohit was selected as Teacher This Week for her sincerity towards work as the Editor of School’s Facebook Page. VRT: On 15th December 2014. VRT: Deepika Tandon was the Principal at that time. VRT: The environment was friendly. VRT: I taught Class II at first. VRT: Be good human beings, valuable resources and education they are getting in the school. VRT: No, I have not taught any school before Fabindia. VRT: The Fabindians stand out of the crowd. So, they should work hard focus and be a successful person and raise the name and fame of their school. 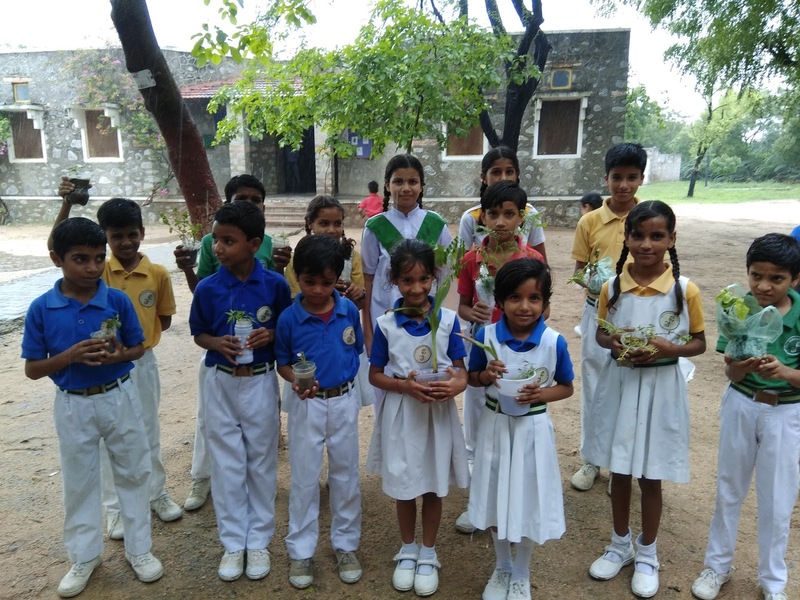 Saturday, 15th July: On the occasion of Environment Week Plantation Day was conducted in School under the guidance of Ms. Kusum Sharma/ Activity Coordinator. Students of Class VI-XI were divided into two groups. 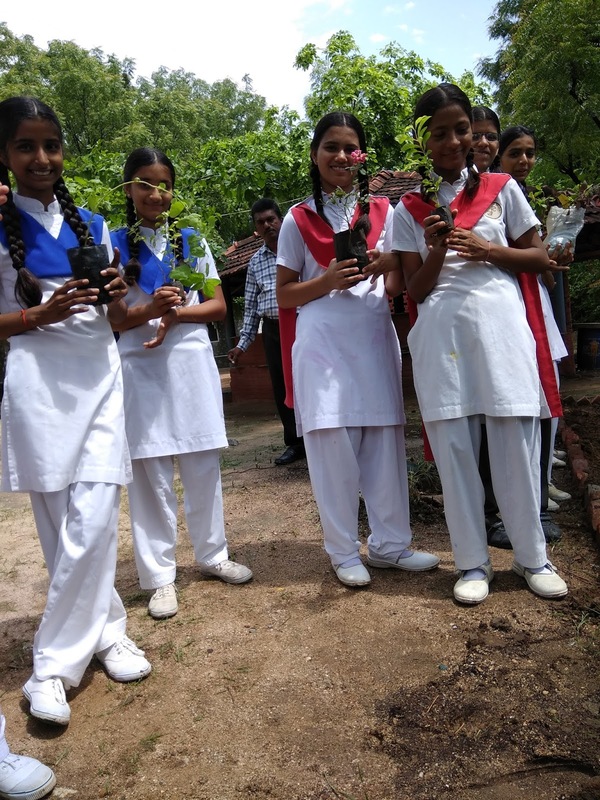 One group with their teachers planted medicinal plants which were donated by the students. Environment Awareness Rally was conducted in Bali Town. 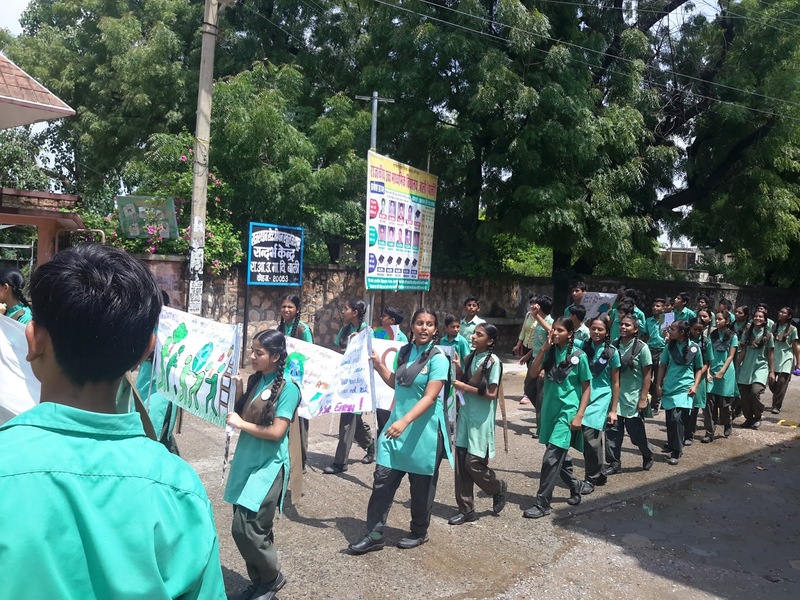 Forty Students escorted by six teachers started the rally from Kacchari Boya Road to Govt. High School. They carried posters with them, shouted slogans all the way. They gave the message to Save Environment and stop using polybags. 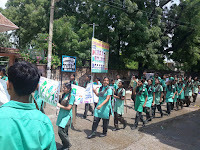 Students went shop to shop and interacted with them and told them not to use polybags. At Ranjan Saray Chowk Municipal Chairman came to motivate the students and addressed the public present there. 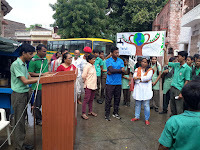 Students gave speeches recited poems regarding the environment. 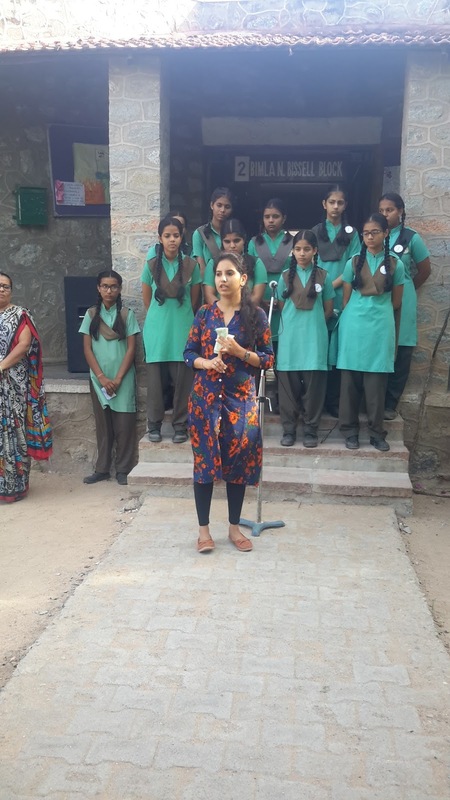 Principal Ms. Rajshree Shihag addressed the public and thanked the students for their participation. 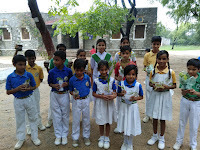 Students were asked to give the message to their parents to save the environment, stop using polybags, reduce use of natural resources. With the support of students and staff, the day was a big success. Thanks to all who made this day a success by giving their support. HOW CAN YOU MANAGE TO SOLVE PROBLEMS? In this summer vacation, we got a task to read the book “Is your child ready to face the world”, by Dr.Anupam Sibal. It is a book that teaches you values and to build qualities in yourself. As I read the book it became more and more interesting and exciting. The situation and examples were given are wonderful and the language is wonderful too. To read the quotation and to understand them gives you a new experience. Our group got 3 chapters to read as task 1. Making Mistakes, Accepting Flaws 2. Determination 3. Forgiveness. Besides that, all the chapters give a new teaching and learning. A teacher must have all these values and qualities in himself or herself so that he or she can mould a child in a better way to face the challenges of the world, be a good citizen and have a bright future. I remember a boy named Vartik, from Teresa house. There was English Debate Competition being held in the school. I had to choose two participants. He was being shy to take part. As I knew he is good in English with a loud voice, he was the right participant for me. Now it was my task to motivate him. I called him then we had talked for some time. I told him to show his talent. Be confident, don’t worry about the result and give your best. Your teacher is always ready to help. At last, he told, Sir, What I have to do for that. There was a smile on his face and on my face too. After that we had a small discussion on the topic of the debate. He noted down the points and made a speech next day. He rehearsed and practised it. He had problems but he managed to solve the problems well. I was glad he participated and the result was that he stood First in debate competition. Monday, 10th July- Friday, 14th July: Unit Test I was conducted in the school for Class II-XII that week. All the students were busy in studying for their UT. On Friday the UT ended. All the teachers were busy in correction and showing copies to their respective subject classes throughout the week.